Triphopp is back with the third edition of “Escape” close to a tiny village on Sohna Road. This is everyone’s chance at enjoying a night of whole lot of fun, outdoor activities. These night outs have been planned for every alternate weekend starting from October 27 (a Halloween special) till March 31. 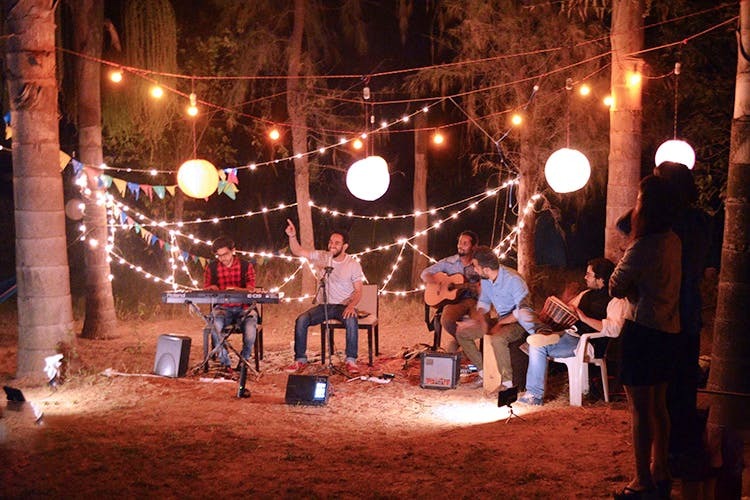 The outdoor set-up at the camp is a party spot in itself. Well, not in the conventional “Dilli sense” of the word but the colours and vibe is the right mix of peppy and relaxing. The gently swaying ball lights, cheerful buntings, the sparkly fairy lights wound around the trees and the charred aromas from the barbecue grill… If this doesn’t sound dreamy to you, maybe just Netflix and chill on your couch. You can have a chill time with bae, cosying up in a camp and forgetting that you’re literally half an hour away from Delhi. They’ve got hammocks, live indie band performances, movie screenings and even bonfire and barbecue. What’s not to like about these? Also, the next morning, the folks at TripHopp offer to take you to the polo grounds close by in case you want to experience the stables before heading home. The first camp stay (Oct 27) will be themed around Halloween and comes with a lot of scary surprises, we’re told. You and your partner can obviously dress up as spooky pumpkins or wear spider earrings for effects – they aren’t judging. The following weeks will experiment with more themes like “Back to School”. We wish these hippie nightouts were happening every weekend instead of every alternate weekend (we'd have more days to choose from!). Not the tent-type? Opt for the luxury rooms where 2 or 3 people can bundle up for the night. Prices for dome tents are INR 2,750/person (+ 5% GST) and for the room, it goes up to INR 3,750/person (+ 5% GST). When: Starting from Oct 27 till Mar 31, 2019. Find the exact calendar on their website (triphopp.in). Timings: 3pm – noon the next day.